A garbage disposal is a common luxury that many home owners have in their home. This system allows home owners to get rid of a lot of their waste a very simple way. Garbage and food items can be placed in the garbage disposal so that home owners can get rid of these items quickly. However as beneficial as the garbage disposal can be, many home owners do not understand how to work one properly. many times, home owners will place items in the garbage disposal that do not belong. Below are three common items that should never be put in the garbage disposal. A common factor involved in cooking is grease or oil. Any type of fat is commonly used to cook with and theses substances must be disposed of when the cooking is completed. However, these items should never be placed in the garbage disposal. As grease cools, it begins to solidify. If this type of item is placed inside a garbage disposal, it will cause the unit to stop working as it will have a large solid blocking the drain. Another item that many home owners place down their garbage disposal is stringy vegetables. These vegetables, such as celery, lettuce, chard, kale, potato peelings, can wrap around the blades of your garbage disposal and cause the unit to clog and freeze up. It is essential that these items are not placed in the garbage disposal to keep the unit clear and working properly. Another item that many home owners put down the garbage disposal that does not belong is pasta. When cooking with pasta, one will notice that the noodles will expand. As the pasta hits the water, it begins to grow and grow. If pasta is placed inside the garbage disposal, it is guaranteed to get wet. Once the pasta becomes wet, it will begin to grow. This can cause the drain to stop up and the blades of the unit to become caught on the noodles. Always refrain from placing pasta down your garbage disposal. It is essential that home owners remember to keep their garbage disposal clear of items that will do harm. Keeping your garbage disposal clear will ensure that the unit continues to function as it should and you will have little to no difficulty. 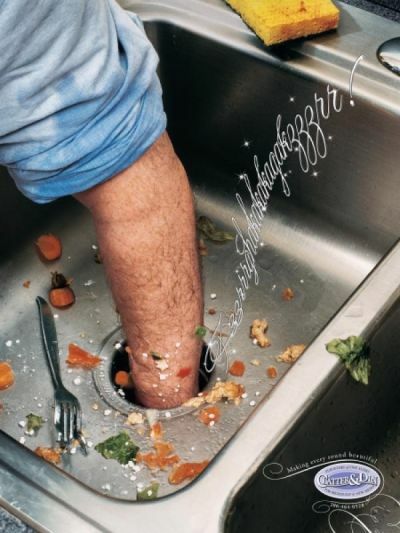 If you do have problems with your garbage disposal, remember to contact your local plumbing company for quick repair service.